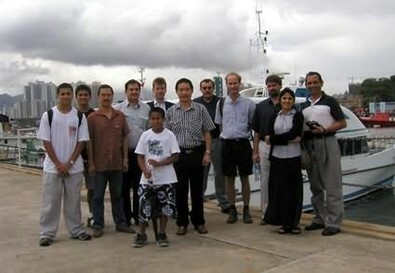 On Saturday 22nd June 2002, more than a dozen members and guests proceeded to the Government Dockyard on Stonecutters Island to visit the Hong Kong Hydrographic Office. We were greeted by Capt. K.C. Ng, Hydrographer, and Capt. Ivan Shuen, Assistant Hydrographer, and shown an impressive powerpoint presentation on the work of the Hydrographic Office. This presentation is attached, and is reproduced with the kind permission of the Hydrographer. The presentation was followed by a tour of the offices. Highlights included a brief look at some historic charts of Hong Kong and a demonstration of the impressive computing power of a modern hydrographic operation. The intricacies of DGPS were explained very clearly, then we were shown some surveys of unusual objects on the sea bed, and Capt. Ng explained how his staff are on call to fix the position of sunken vessels or cargo containers. One one occasion, they even located a small vehicle which had been jettisoned by smugglers! We were then given a tour of a modern survey vessel and its equipment (which takes up suprisingly little space), including electronic charts of HK which are on trial at the moment. Our hosts spent considerable time answering our many questions. Members agreed this was one of the most interesting visits we have made, and expressed profuse thanks to our hosts. It is reassuring to know that our hydrographic office is run by such capable mariners, who have first-hand knowledge of what their customers require. This is a visit which will certainly be repeated in the future.